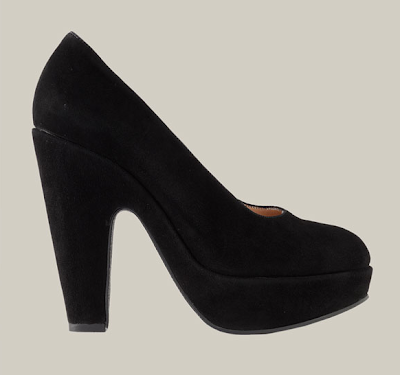 For months now, i've been agonizing over finding the perfect pair of black pumps. Classic, elegant, ads refinement to an edgy outfit, i can go on an on as to why i'm on the prowl for this specific type of footwear. However, there is a glitch: for some reason pumps generally have a hard time staying on my foot. I do reckon i've got midget feet for my not-so-midget height (size 6 shoe on my 5'6 frame... weird) and my heels always flop out of the shoe as i'm walking. You laugh, but i tell you it's a major problem and over the years i've learned to cope with the fact that i will never ever be able to wear slingbacks (unless i want to stop at every step to fix the back binding). I have a gorgeous pair of black suede pumps that are so classic, i've had them for years, i've never worn them and they still very much feel current (i'd say that's a testament to how much they transcend all those blink-and-you-miss-them trends). Basically, they are a good quality pair that i could keep and wear forever. Alas, they do the dreaded ff (foot flop), as i call it, for lack of a better term. And although this personally coined appellation might be endearing, it's anything but: i live for shoes (in case you hadn't noticed) and my longing for this specific style has begun to be painstakingly unbearable! And this comes wayyy before i turned my shopping habits around, although i've now become way more determined than ever. I've resolved to INVEST in a pair of classic black pumps - not the tacky pointy stuff, but something feminine and edgy all at once, to match my personality (yes, a pair of black pumps CAN reflect one's identity, guaranteed!) and for me to wear with my most ripped up distressed denim, as well as my most adorable black mini skirt. Indeed, i'm ready to shell out 600$ for a pair of perfect fitting, non-ff inducing pair of comfortable heels (i live in heels, so this shouldn't be a problem) that i will be wearing for years and years to come. And long live the mantra: Quality over quantity! Amen. the chayalan's are pretty, however, i'm afraid your feet would go flying out of them! 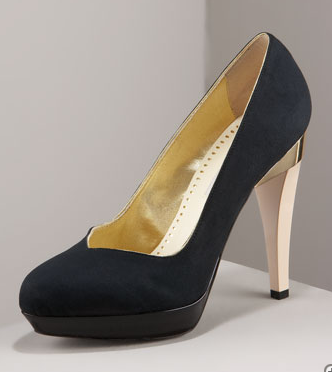 am looking for the perfect pair of black pointy toe pumps. still haven't found them... it's been about 6 years now. i definitely need to invest in a good black heel! those Hussein Chalayan and YSL heels are to die for! I love the heel on the Stella's. i agree! i love the YSLS!